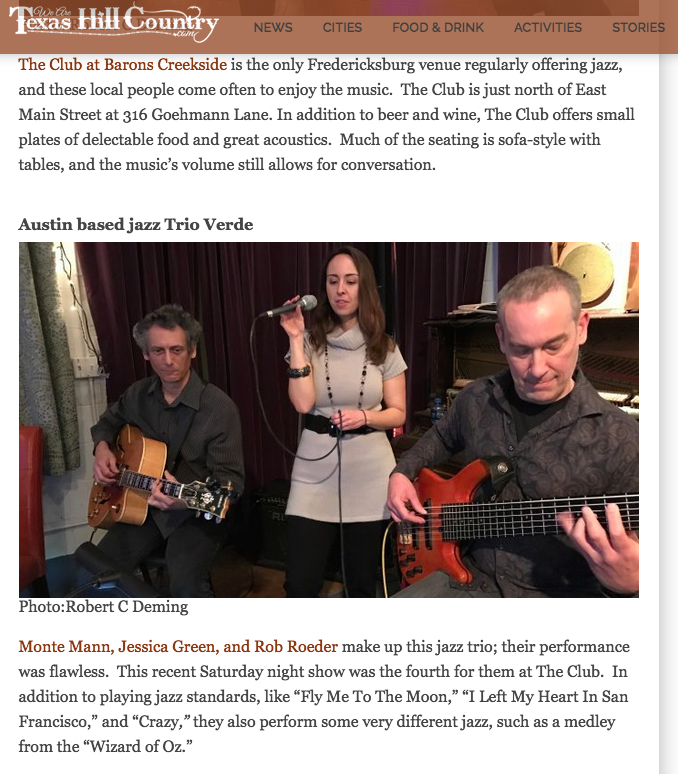 Formed in Austin TX in April 2013, Trio Verde brought together 3 of Austin's most experienced musicians - vocalist Jessica Green, guitarist Monte Mann, and bass player Rob Roeder. The band's goal was to perform classic jazz, R&B, and blues, and to have some fun bringing some new material to classic jazz styles. 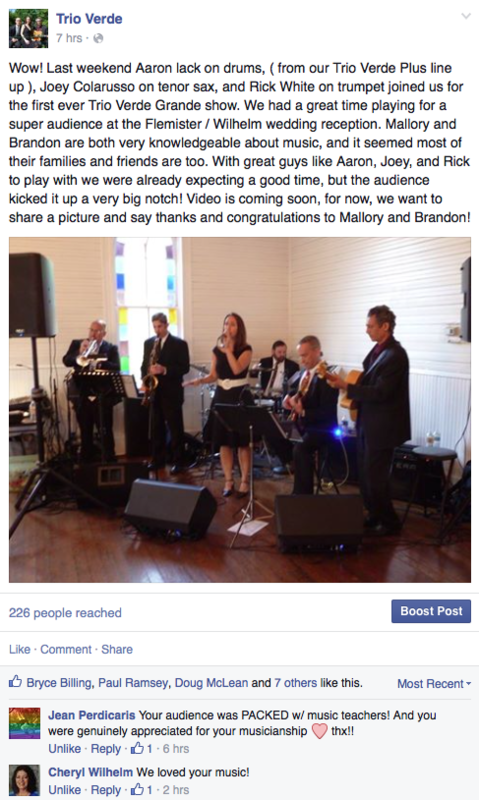 A swing version of Michael Jackson's "Billie Jean"? They do that. Lady Gaga's "Poker Face" performed as a bossa nova? They do that too. ( They've 'jazzified' music by people ranging from Luciano Pavarotti to Lana Del Rey to Ozzy Osbourne! ). 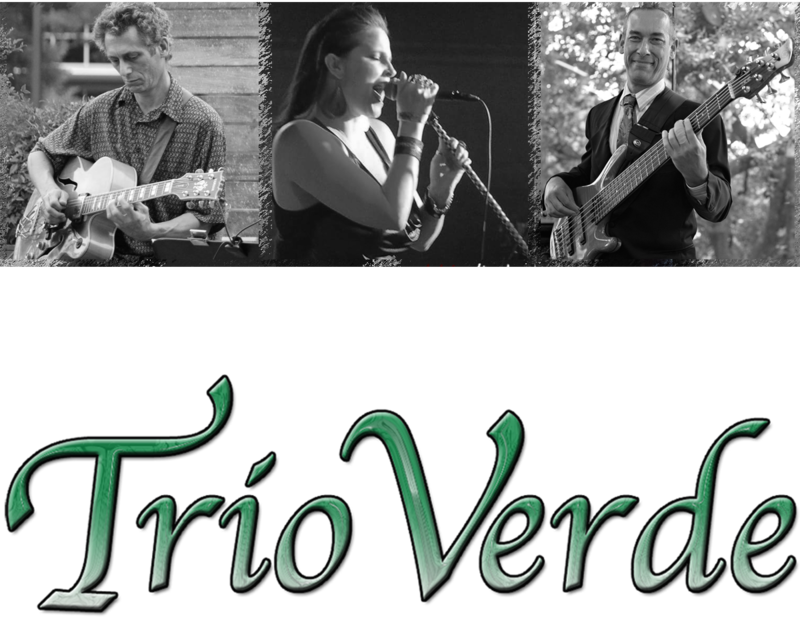 Playing without drums or percussion demands excellent musicianship, and Trio Verde rise to the occasion. It also means they have excellent control over their stage volume and only require a small space to put on a big show. 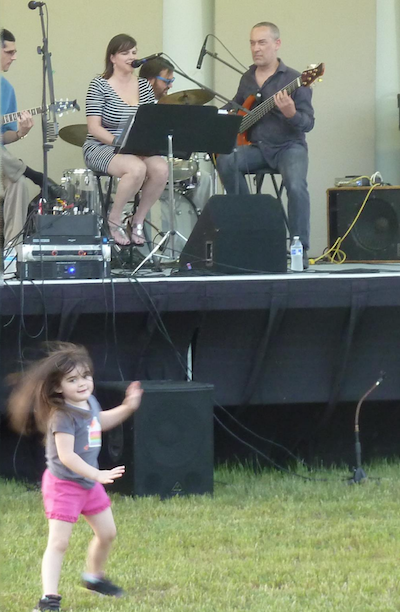 But the band is also suitable for situations where energy and excitement are more important than subtlety. 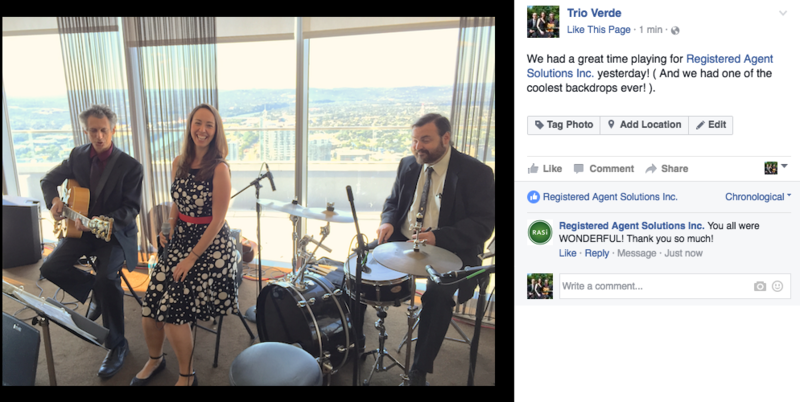 Starting in January 2015, the band began to occasionally play as Trio Verde Plus, supplementing the basic trio with Aaron Lack on percussion. In July 2015 the band played for the first time as Trio Verde Grande, adding horns to the Plus line up. Trio Verde Grande brings the same unique musical quality to an even higher energy level. After 4 years of gracing our shows with her gorgeous vocals, Jess moved to the east coast in mid 2017. 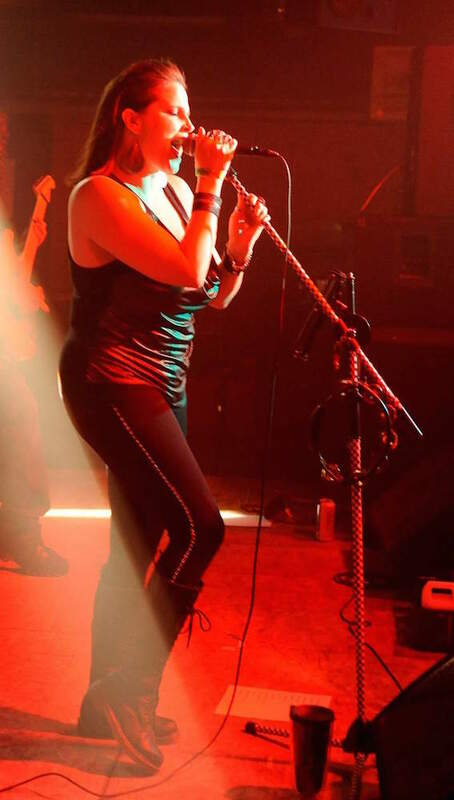 We were sad to see her go, but excited to welcome Kember Ottley as our new vocalist! 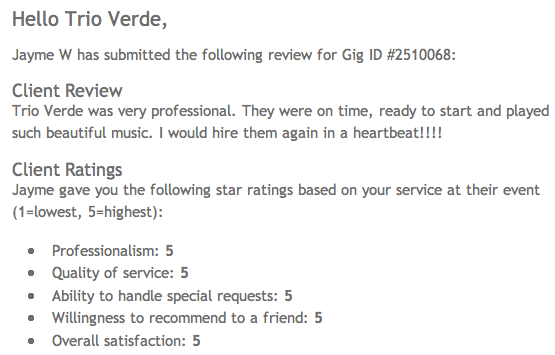 Trio Verde, Trio Verde Plus, and Trio Verde Grande, are all dedicated to first class professionalism. 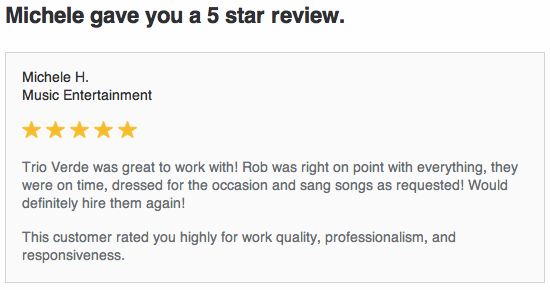 Doing business with the band is almost as enjoyable as listening to them! I just wanted to thank you and Trio Verde for a great performance last night at our Elks Valentine's dinner! I heard many, many comments from our guests how great they thought you were, what a refreshing change of pace your group is! 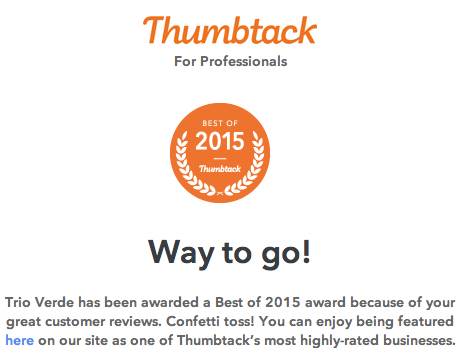 I would certainly recommend they hire you all again! "Everyone had a great time, y'all were the perfect ambiance for our party. Thank you very much!!" "Thank you so much for playing :) you guys were wonderful. 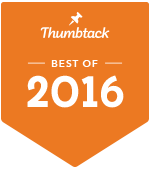 A million thank yous"
"Trio- thanks for a fabulous Holiday Party!! Hope to book y'all again!!! " Main photo by Deborah J Cano, Hot Tamale Photography.